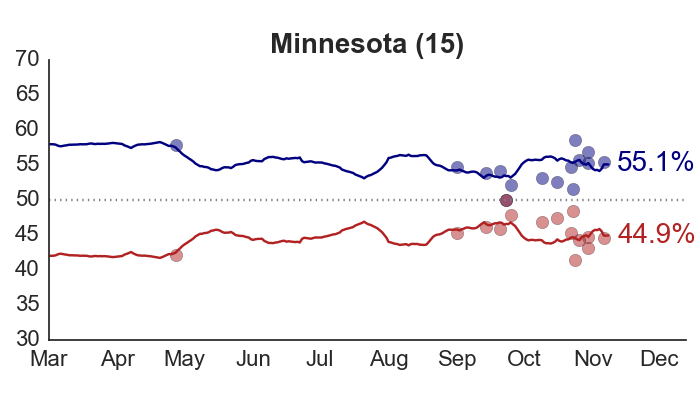 I’ll be updating my forecasts and trendlines from the latest polls every day or two between now and the election. I know everyone is anxious about the outcome. But there’s a limit to how much we can learn about the race on a daily basis. The high-quality polls take a few days to complete, and the data are so noisy that we need a large number of them before a trend can be confirmed, anyway. The comments on the last post got a bit long – you’re welcome to pick up the conversation here, and I’ll try to respond where I can. Edit: The site has started getting a lot of traffic, and sometimes isn’t loading properly. Apologies; I’ll see if there’s anything I can do about it. Do you have a parameter in your model to account for your left wing liberal ideology? 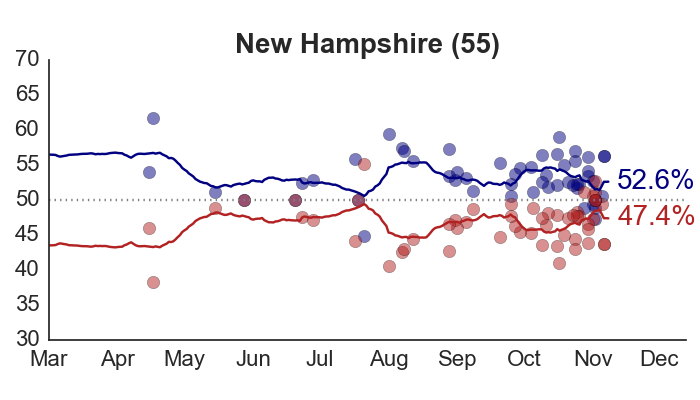 Romney has MOMENTUM. Deal with Linzer! MOMENTUM IS STRONGER THAN MATH. The media coverage of this election has been baffling. 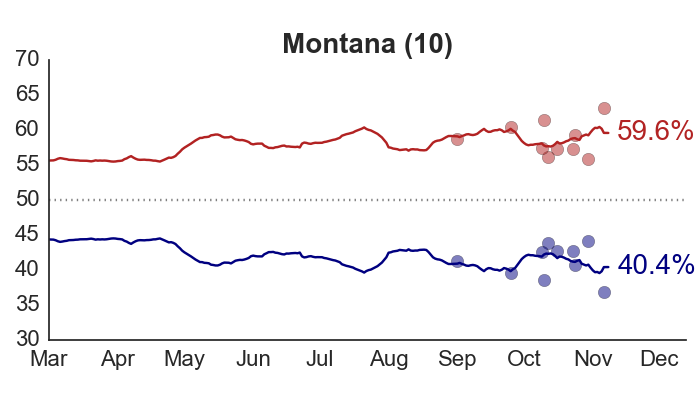 Mainstream news is still proclaiming “Romney Momentum” despite all data that points otherwise. 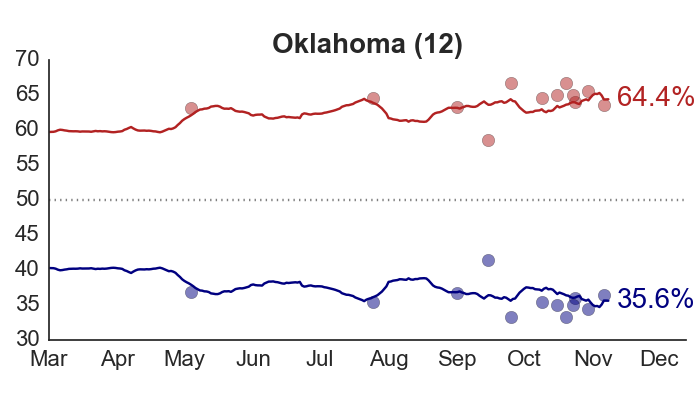 Its clear from pretty much every forecast that Romney’s moment has stopped, if anything Obama has been gaining. 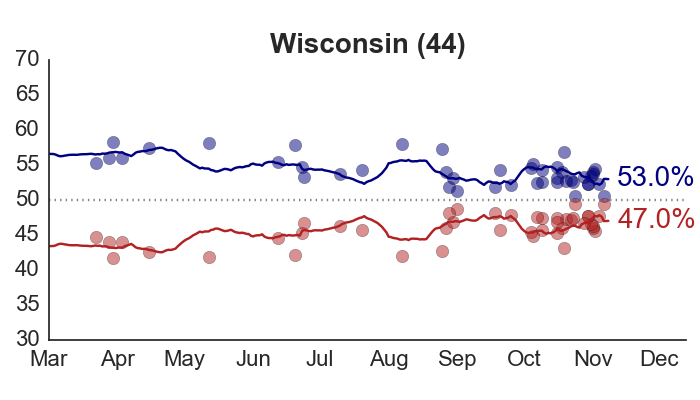 Over all Romney has surged about 4 pts in October, but still trails in swing state polls, especially the mid west. 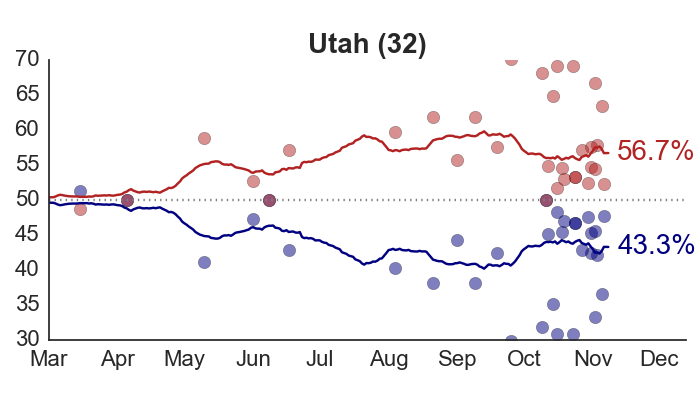 Never the less the media and republican pundits have been suggesting this supposed continued Romney momentum will lead him into a landslide victory. 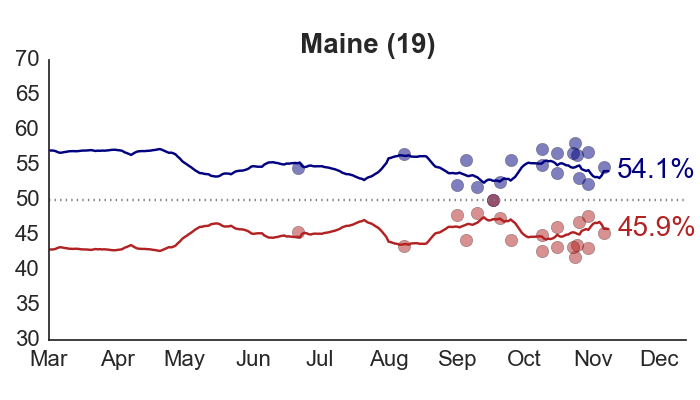 But from the data we have, it looks like Obama could likely win by over a 100 EV margin. But of course, we’ll find out in November. Dr. Wang says that stuff is baked in, like economic data. I sort of agree. 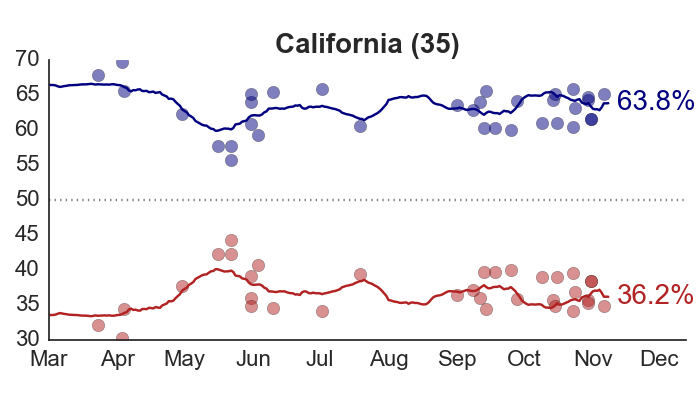 But if enthusiasm is asymmetrical dont more republicans get polled? Because the pollsters wind up only polling citizens that will accept a poll, and that means enthused people and landline onlies. And what do you think of RAND? Doesnt this look like asymmetrical enthusiasm? Your argument is persuasive, but I must aver that no amount of momentum by Mr. Romney will matter in the case that Mr. Obama wins 270 or more electors on the evening of November 6th. lol, thats because while “conservatives” can buy a derivative, they have absolutely no idea how to calculate one. ““conservatives” can buy a derivative, they have absolutely no idea how to calculate one.” Lmao! I think they have no idea what momentum is, either. It’s just something they feel in their gut, like gas. 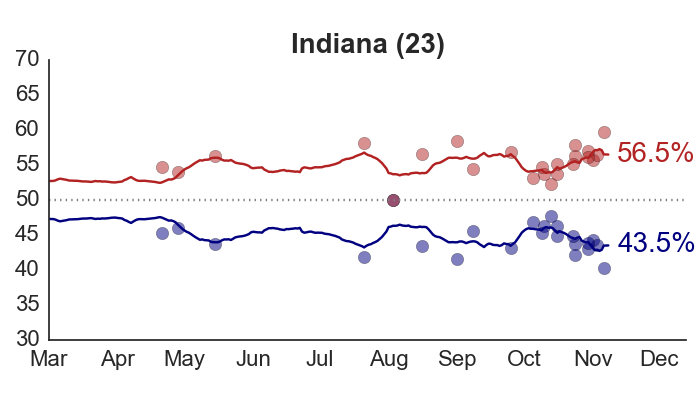 Romney hasn’t led in any Ohio poll on Real Clear Politics since a poll done from 10/6 to 10/10 by Gravis. 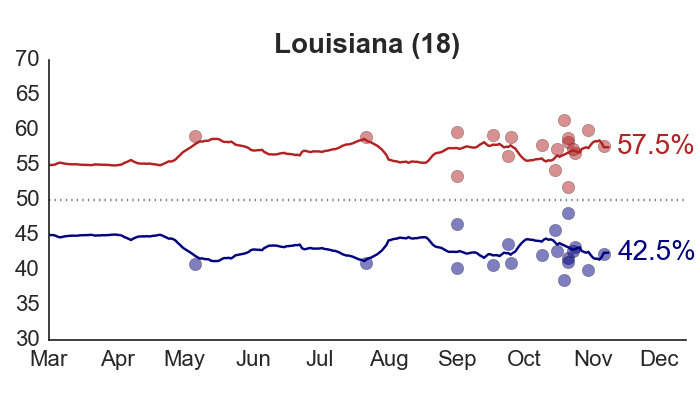 He’s only been tied with Obama in three polls since that Gravis Poll. 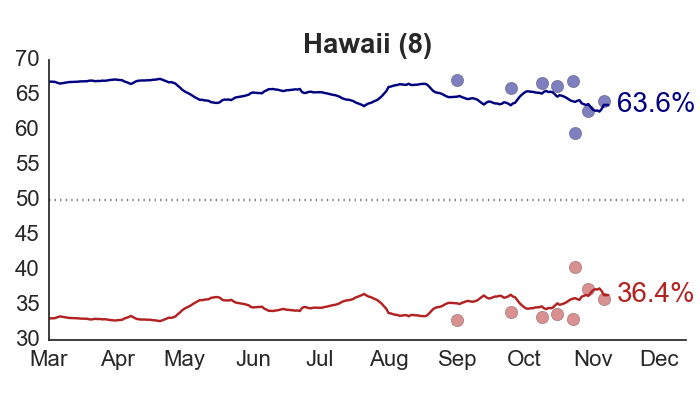 Obama has led in eight polls over the same period. 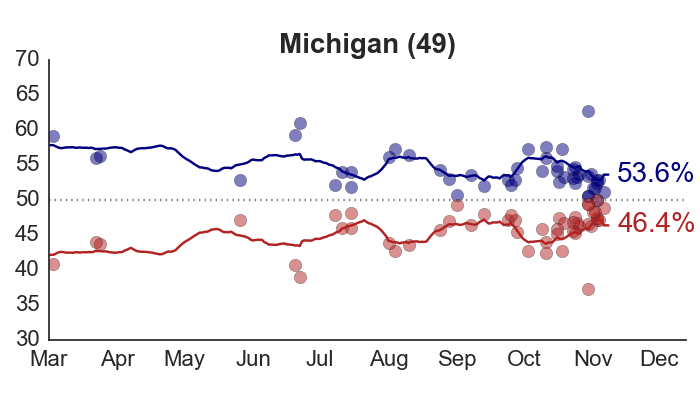 Doesn’t seem like the kind of “momentum” you want in arguably the most important swing state in the election. 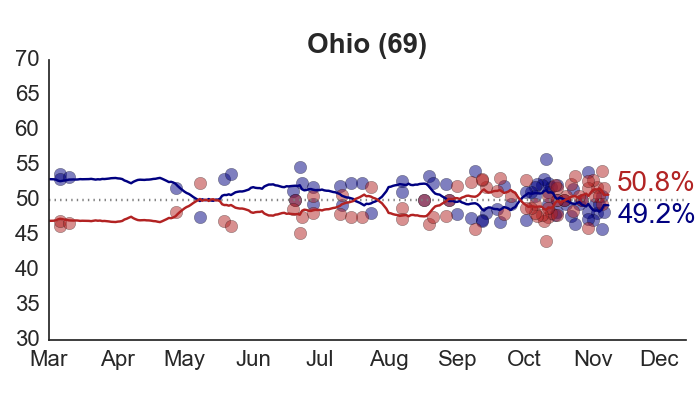 I would also think that if the Romney “momentum” narrative was working we’d have seen something in Ohio, as it’s currently getting hit the hardest by both campaigns. Romney might win, its really close, but if I were him, these are not the kinds of numbers I’d want to see 11 days before the election. Every time I read the Rasmussen poll numbers I’m always reminded that they’re robo calls that only call land line phones. Sure, I have a land line phone, but neither of my grown children do, nor will they ever at this point. They also point out to me that none of their friends have them either, nor will they ever. So every 4 years another huge and growing part of the electorate doesn’t get polled by Rasmussen. Rasmussen will continue to become more inaccurate each election, IMHO. Having a landline makes me feel like such an old dork. As a former Telco exec I can say that we started losing land line customers to cell carriers in the 90s and it has accelerated every year since. I am now the only member of my family with a land line, and that because my former company pays the bill. All my kids and voting age grand kids have cells. Guess who they support? 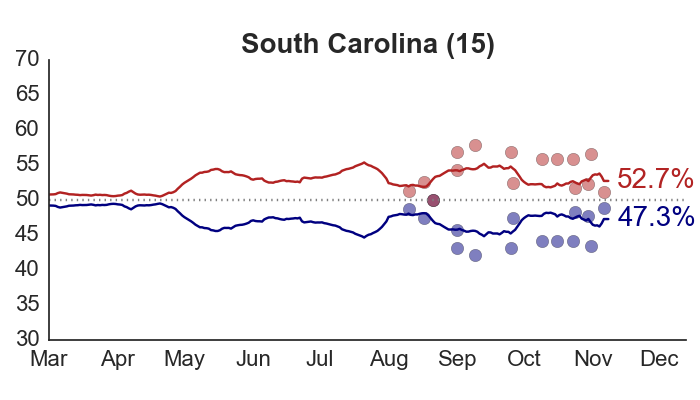 You seem to have Obama favored very slightly in Fl and even in NC on your map which seems contrary to RCP and even Nate Silver. Judging by your predictions, Bayesian updating seems to lead to a lot less volatile results than Nate Silver or Sam Wang’s Monte Carlo simulations without the Bayesian update. I am new to this site, and you might have already explained why this is so. Perhaps, if you have, you will point me to the relevant post. @Partha, Nate uses monte carlo sims for the forecast. But both PEC and the 538 nowcast are poll only. Rev. Bayes commands the field of forecasting in contemporary analysis. Everyone uses it. Cell-onlies are ~32% of the electorate. Smartphone users are 47%. 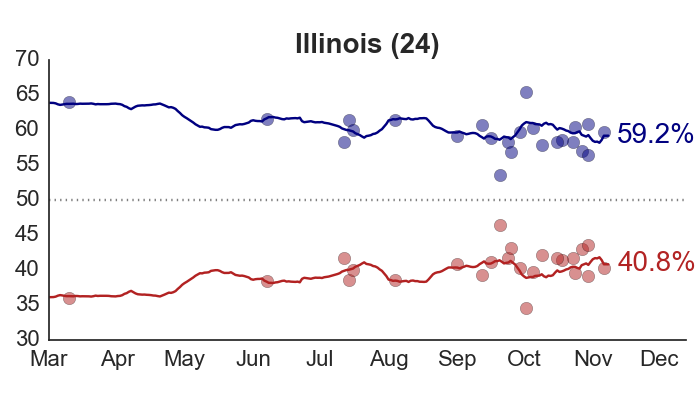 Both demos go Obama by 20 points. 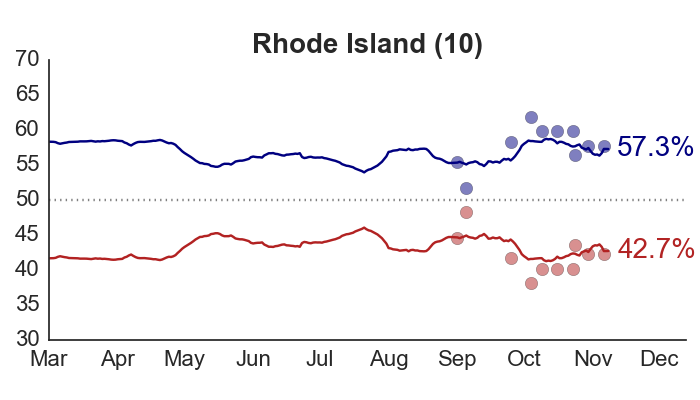 My problem with Nate Silver is that he seems to be papering over differences in the national and state polls by including results from things like Rand (the most favorable Obama result). However, Rand isn’t a poll, it’s a survey that asks the same people the same question again and again. It’s kind of interesting but those folks long ceased to be representative of anything but themselves. Drew — Following your method with great interest here. 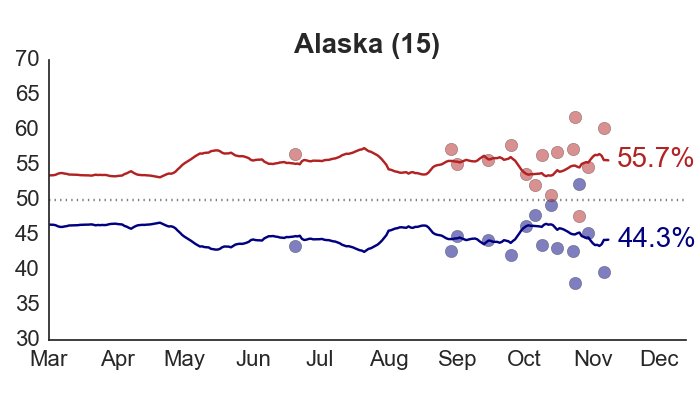 Your prediction has been astonishingly stable throughout the race. 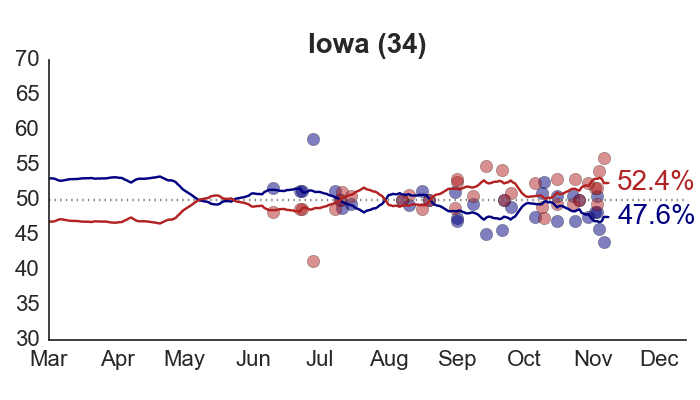 It’s also now ~30 EV larger than either PEC or 538, which both seem to be hovering around more like 300 EV for Obama. Why is that? Where’s the difference coming from? Is your initial Bayesian prior still anchoring the race? Are your poll adjustments moving the outcome? I’d love to hear a method comparison. P.S. Other commenters: I think that “MOMENTUM IS STRONGER THAN MATH” was a troll. A brilliant, brilliant troll. People don’t actually believe things that stupid; they just say them to get a rise. It seems like the only real difference btw. PEC/538 and this model is FLA. Without FLA’s 28 EVs they are all pretty close to the same and FLA is pretty much 50/50 in this model. Paul: Yeah, that 30 EV difference is basically just Florida, which my forecast has been predicting for Obama. It’s still the prior doing that, but the effect is wearing off. 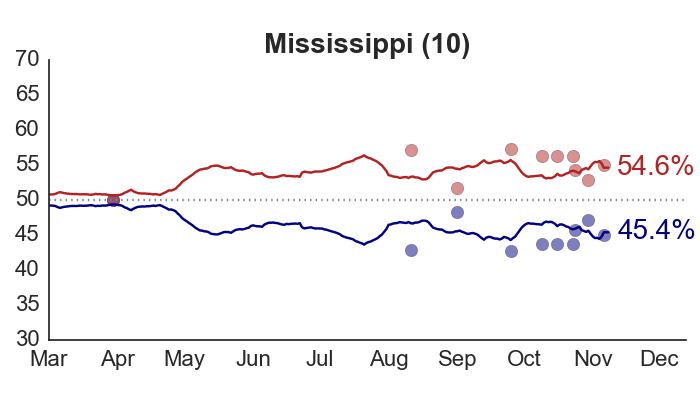 If the polls continue to stay so flat, it will probably flip within the next few days, and then my forecasts will look more like the others. Partha: It’s not just that it’s Bayesian, but that I’ve designed the forecasting model to be robust to the short-term ups-and-downs in opinion that happen in response to campaign events, but don’t necessarily impact the outcome of the election. Depending on how technical you want to get, you can read more about it on the site or in the research paper. 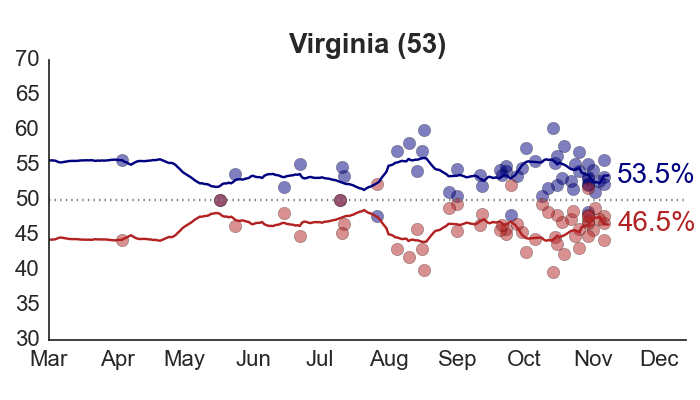 Paul: Actually I think 538 is pretty much in agreement with Votamatic — it’s true that 538 is presently declaring ~295 EVs for Obama, but that’s a mean or all simulated outcomes. If you look at 538’s “Electoral Vote Distribution” chart you’ll see that ~330 EVs for Obama is predicted as the most likely outcome. 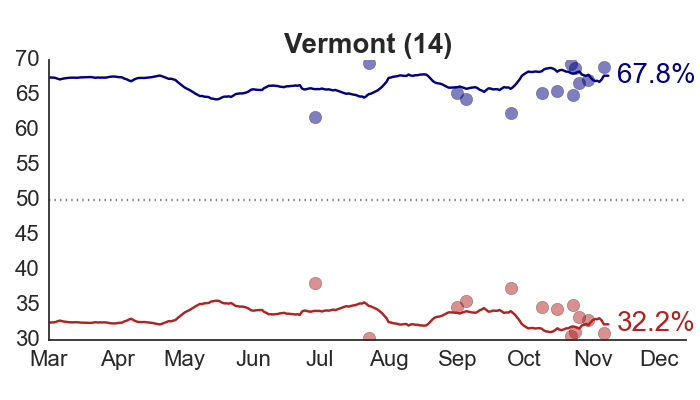 Yes, Romney has momentum. So does a sinking stone. Hedgehog, this is the exact same comment you posted at PEC and it reflects a profound misunderstanding of both 538 and RAND methodology. From what I see in your paper, there is a source of uncertainty that worries me. You assume national effects vanish as election day approaches, and voter fraction becomes unique to each state at election time. You accomplish this by nailing the national component to zero through your reverse random walk. That worries me. Your backward random walk should originate in a random state (around zero perhaps), to reflect undecideds going one way or the other “at the last minute” (since that information isn’t contained in the daily polls). As is, unless I misread something, your model seems to leave out the variability induced by last-minute deciders. you posted that exact same comment at PEC and it was not well received. But maybe you will have better luck here. may i suggest you read the RAND methodology. One thing RAND does is they have solved the non-responder problem. The pay $2 for every survey returned. It seems you mixed me up with someone called “hedgehog” or something like that. My question about driving your delta to zero in the final state of your reverse random walk raises proper issues, but if you don’t want to address it, that is fine. I am a bit surprised at your response, frankly. Wheeler’s Cat – I didn’t see a response at PEC so I thought I’d try here. My question about Rand wasn’t whether they were sampling accurately but was whether asking the same people the same question again and again was relevant to the larger population? To me, it sounds like they are now a fish bowl and really only representative of themselves. As a sociology experiment, it’s interesting but in terms of prediction of the national vote, is it saying anything? Reading thru your link, I didn’t get the sense that this had previously been tried and proven out against results but if it has, I’d like to know how it did. if you read the methodology you would know that the RAND panelists were randomly selected. First, it allows us to ask the same people for their opinion repeatedly over time. In comparison to most polls, this leads to much more stable outcomes; changes that we see are true changes in people’s opinions and not the result of random fluctuations in who gets asked the questions. 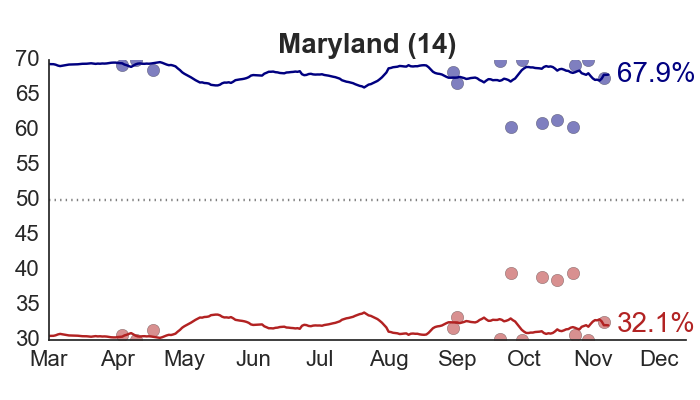 Nate already gave an explanation of why the nat’l polls are different from the state polls. Differential sampling of cellphone demographies. He isnt “papering over” anything with RAND. Are you new to this Internet thing? Drew never responded to you, someone else (wheeler’s cat) responded to another person (hedgehog). Stick around, I’m sure Drew might answer your question when he gets a chance, its a good question worthy of discussion. Drew: Thanks for the explanation of the Florida difference! Does your structural model’s contribution go to zero as the election day approaches, i.e. 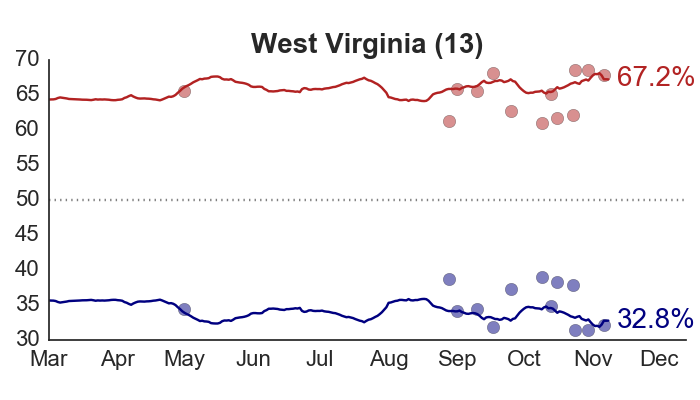 does your method assume that polling is an accurate snapshot of current opinion on election eve? Or do you leave some structural contribution in right up to the end, in compensation for some deficiency in polling? 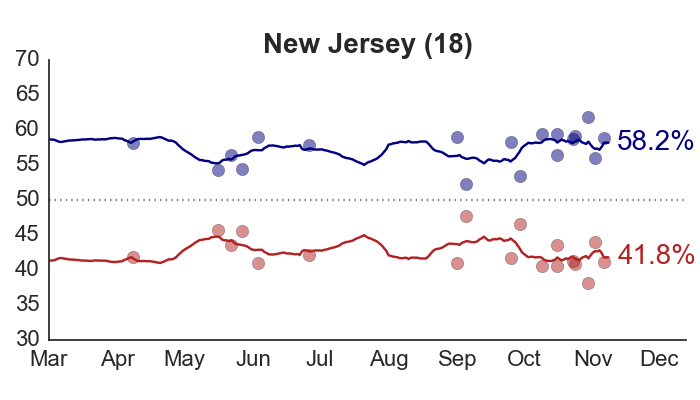 (2) Use aggregate polling to generate a snapshot of the current moment. 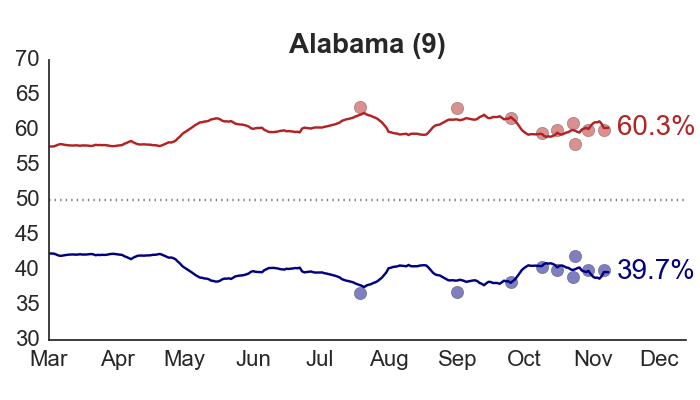 (3) Compute how accurately polls have predicted past elections this far away from election day, and use that to increase the sigma on #2. (4) Combine #1 and #3 with standard Bayesian math. You’re doing something a bit like this but cleverer — right? You totally lose me in the “tomorrow’s best estimate” / “working backwards and forwards” section of your explanation. I’m out of my depth with the stats, but still find it all fascinating. Do you take into account the shenanigans that are taking place in Florida and Ohio? The challenges to voter’s eligibility and their history of creative vote counting could cut the margin by a point or two. What do you think? Can you link to this response? I just went there and don’t see it. Maybe it was a rude response and the moderator deleted it (sort of like your silly pants on fire response)? Do you have any evidence that asking the same people the same question again and again more accurately represents changes of opinions rather than just hardening those opinions making them less likely to change? 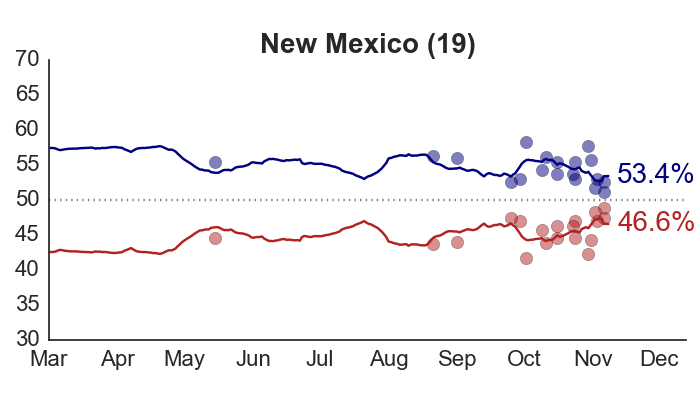 As for Silver, I understand his argument about state polls being more accurate than national polls. However, in his column last week he argued that the national polls were tied. He did this using the Rand poll and the Google Poll which were much more favorable to Obama then the other polls. (BTW, does anyone know anything about the Google Poll because I didn’t see it on Google?). 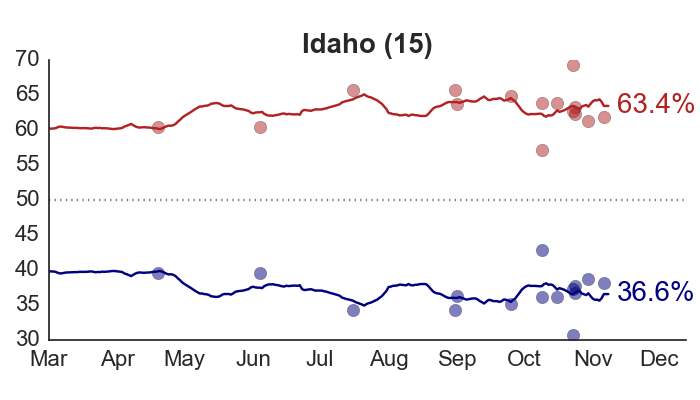 If you use the common national polls, Romney is ahead, hence the disconnect. I don’t mind arguing that the national polls are wrong, but saying they agree with the state polls is questionable at best. Dr Wang deleted all responses to your sillie comment. and you know that, because you responded to my crit. You said nothing about the validity of RAND– you said Nate used it to “paper over”. 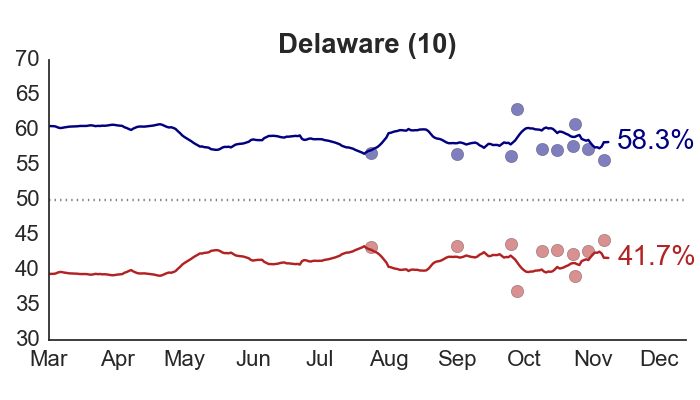 Both Nate Silver and Dr. Wang use all available polls with differential weighting on Nates part. Tant pis if you dont think a poll is “valid”. Build your own model. 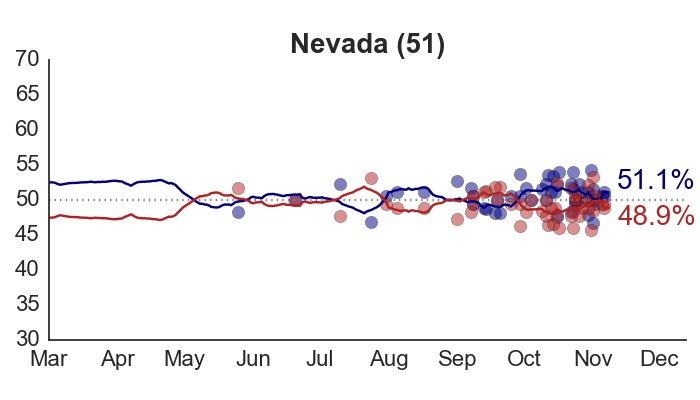 And Nate explained the disconnect between nat’l and state polling. I have linked it for you twice now. 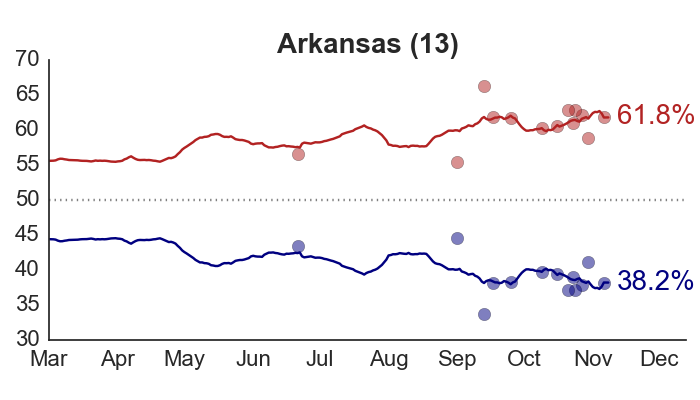 I think you have a “gut-feeling” about RAND. You have obviously not read the pdf. Only the electoral vote counts at the end of the day. So national polling isn’t “less accurate” or state polling “more accurate,” it’s that the state polls reflect more truthfully how the electoral vote will go. The national polls don’t give us that kind of detail. We Democrats had to learn this, painfully, back in 2000. There’s a lot of error that creeps into any poll, state or national. If the polls do their job, then they report the sources of their errors that are known, and observers will suggest errors that may not be accounted for. Question design/rhetoric and sampling methods all need to be looked at carefully. For example, Rasmussen polls tend to have bias to conservative values (probably due to sampling method and lead-in questions), so a poli sci person is not going to take that poll as a wholly reliable snapshot of a segment of the population. In that case, you have to ask, what part of the true proportion of voter support is accurately contained in flawed data? These are not simple questions to answer, but Linzer et al. have taken approaches to this and now the perfect test of their models is near at hand. @David – thanks for the reasoned response. I don’t disagree but it seems than the odds for a split vote versus EV would be much higher if one isn’t more or less accurate. I believe 538 uses these in the calculation. I don’t believe Wang does or Votamatic. @Wheeler – of course I saw your response, why do you think I noted that Dr Wang must have deleted all rude responses except to point it out to you. You may have found my comment silly – but clearly he didn’t have a problem with keeping it while deleting yours. However, it was the only one I saw so if there were others (which you implied), I didn’t see those. Also, you may want to reread the link you keep referencing because it talks about state polls with and without cell phones. At no point does he discuss national polls except for the Gallup poll which favors Romney and uses cellphones (he does imply it as an outlier). And yes, I have a gut feeling about Rand. I could be wrong but there seems to be no empirical evidence one way or the other. As for who is or isn’t a “poll truther”, I wonder if you’d have a problem with me knocking the Rand poll if it said Romney was up 5? Yes, I am new and got mixed up; I didn’t realize that notifications by email refer to the full stream of comments, rather than to direct responses to one’s comment! I actually do think that your question about the representativeness of the RAND poll is totally legitimate. Indeed, if the sample is not representative in the first place, the values themselves are of little value. However, i guess the VARIATIONS over time are more reliable. In that sense, it is indeed interesting. 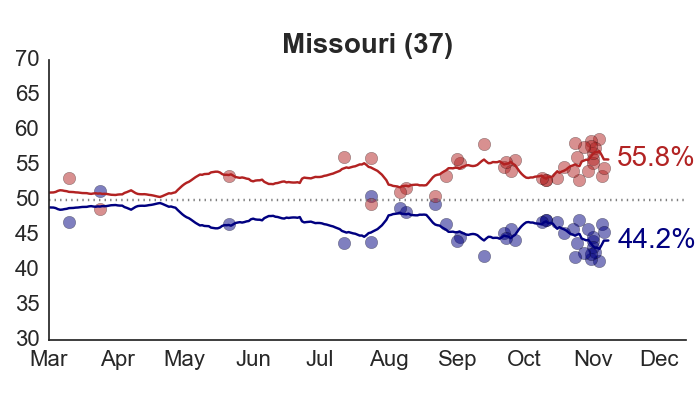 Romney momentum, lol. That’s just a myth cooked up by his team (and parroted in GOP talking points) so they don’t look like they’ve thrown in the towel. The math doesn’t lie. Allan: Thanks so much for giving the paper such a detailed read. This is the first chance I’ve had to reply. You’re right that the model assumes that the national effect (the delta term) goes to zero on Election Day. This implies that the polling average isn’t systematically over- or under-estimating voter preferences on the final day of the campaign. When I checked this assumption for the 2008 polls, it didn’t turn out to be a problem. But it’s an interesting question as to whether there should be more uncertainty in the forecasts to address this possibility. I’d originally been thinking of the issue in terms of pollster biases, but as you say, it could also be because undecideds are disproportionately breaking one way or the other. I’m going to think about this some more. It seems there would need to be an estimate of the proportion undecided, as well as some other assumptions about the plausible range of ways they might go. My model does tend to be a bit overconfident late in the campaign, so maybe a correction like this could help. Paul: Quick answer, yes – the effect of the historical factors gradually wears off over the campaign. The exception is in states that go all the way to Election Day without getting polled once. In those cases, the structural model fills in (along with the relative trends in the other states). 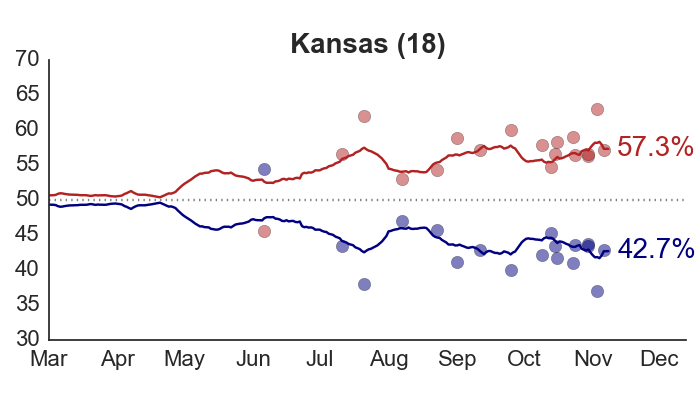 But for the most part, as long as there’s been a couple of polls in a state, that’s what will drive the final estimate. You can read all the technical details in the research paper; the method isn’t exactly as you describe, but pretty close. If you know R/WinBUGS and want the replication code, email me. ima grrl. you cant have read many of my comments if you missed that. Hm, yeah I’d have to look over methods again to see how they arrive at their odds. And then there’s other things to take into account, but probably having negligible effect, such as variations in sample size relative to population size (where population is either national (general election) or it is a vector of populations by state for EV). Combining state polls into a single state poll also runs a slight risk of sampling with replacement (i.e. counting people twice), but again, with the sample sizes being taken, it should be negligible. The most accurate way not to bias the odds would be to use the same data that gave the EV estimate, since that should give an effective estimate of the national poll as well; in which case, I would expect the odds for a split vote to be lower than one might think (that’s one reason for doing statistics: to uncover hidden expectations that are wrong). 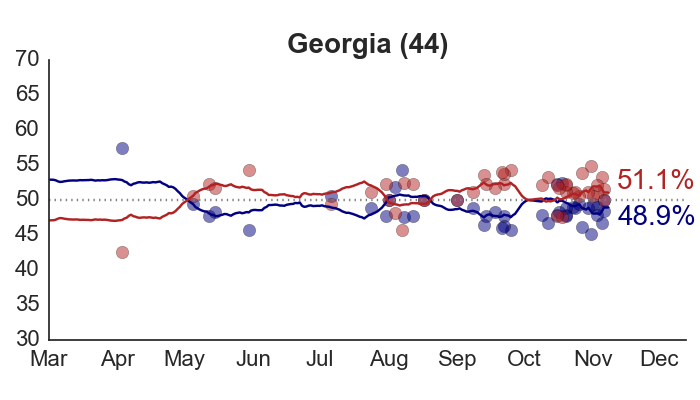 National polling is difficult, partly because the chance geographic (and hence economic) bias is going to be difficult to avoid. There shouldn’t be a bias to any particular resident, so you’re going to get emphases in highly populated areas, which have different needs then low population density areas, and in these two broadly defined types of geographic areas, you will find a different economic stratification. Are the light blue and light red shaded areas around the forecast lines meant to represent brackets of uncertainty (in terms of std dev, for example), or are they purely decorative? If they are not decorative, I wonder why they are so asymmetrical. Since the forecast is a simulated mean, you expect that mean to be Gaussian. Quantifying the bracket of uncertainty is important. I wish 538 did it, but they don’t. Without a bracket of uncertainty, it is impossible to have an intuition for how far off the simulated expected outcome can be from the actual one on election day. @PM – thanks for the reply. I am admittedly a Romney supporter but I’m not here to convince anyone that their models are wrong but just ask whether they are in fact considering other possibilities (explained without the use of the words bayesian or fractal or the ever popular “you just don’t understand”). Now that I’m thinking about it, the idea of the Rand poll might be improved if you could find out the opinion of the same group over time without them actually knowing they were being asked again and again. I just can’t think of many ways to do it that are both legal and ethical. @Wheeler – ok you’ve demolished one of my female stereotypes, congratulations … I think. The means won’t be in the center of the error bars, because the distributions are not normal. If X is the number of EVs for the incumbent and Y is the number for the opponent and independents do not win an EV (which is almost certain), then X + Y = 538. Now, X and Y don’t change by 1s, they have discrete jumps in values like ±3, ±6, ±8, 10, 29, 38 etc. depending on when a state is seen to shift its favors one way or the other. Moreover, the chance of a transition in any of these values are not equally likely. 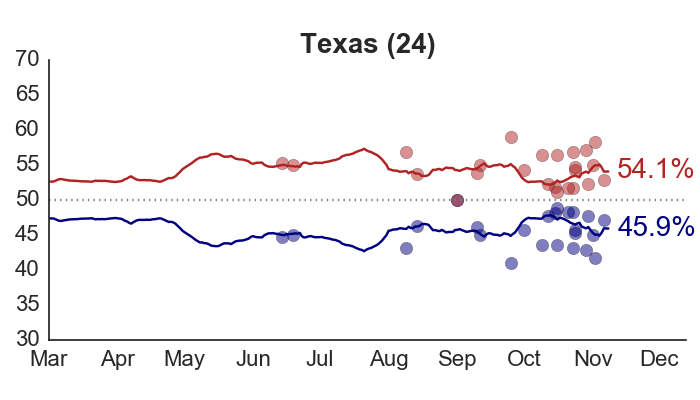 For example, Texas will almost certainly go Romney, so the chance of X being increased by 38 is about 0. In other words, the possible transitions in values of X/ Y are not equally likely to occur. Thus the errors of estimation on either side of the estimate are not going to be symmetric in all probablity. It would be cool to see the 99% intervals too, but the intervals widen and that tends to cloud the underlying trends, while including 1 in 20 longshot outcomes. Alors, you are complaining that I use big words you dont understand? 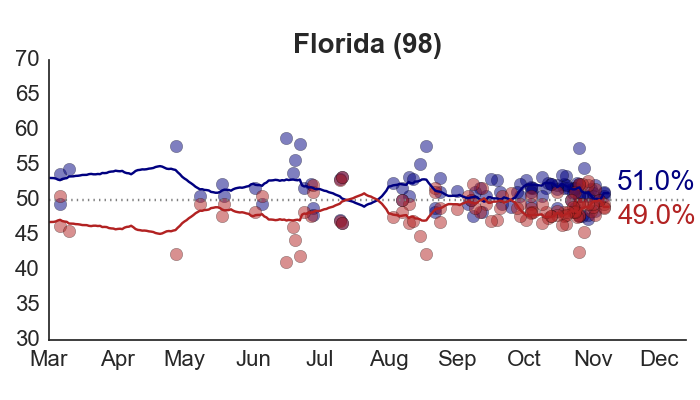 Well Public Policy Polling has Obama up 1 in FLA which backs up your model saying the state is right on the knife’s edge. For those that dont google….John Wheeler and Albert Einstein lived in the same neighborhood, and Dr. Wheeler’s cat was very fond of Einstein. So the cat could be found either at Wheeler’s house or Einstein’s house…. thus Wheeler’s Cat– much luckier than Schrodinger’s cat. Regarding your discussion above about the break of undecided voters on election day. How has this gone in previous elections? 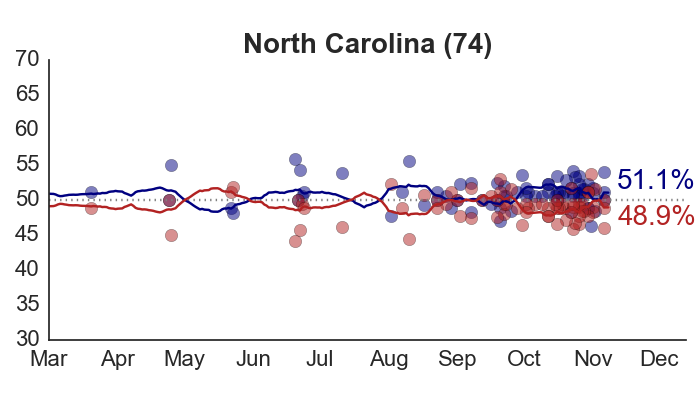 Do undecideds historically break equally to each candidate, do they break consistent with their own state polling averages, or do they tend to go in a last-minute wave towards one candidate? Am I right to assume that if the former is true this would pose very little risk to your election projection, while if the latter is true, this is reason for worry? Apparently conservatives see condescension everywhere these days. Perhaps Krugthulu can explain yourselves to you. And Hedgehog is a poll-truther. He is critiquing RAND without having any knowledge of their methodology, and accusing poor Nate Silver of “papering over” a singleton poll in Obama’s favor. Nate Silver is under a barrage of “conservative” attacks right now. It should not be tolerated on sites like PEC and votamatic imho. But its your site, Drew. you make the rules. its apparently fine for PM to crit comments *i made on another site* and I suspect Dr. Wang deleted his comments there accusing me of being *uppity* and *condescending*. Since I havent talked about Taleb, fractals, gene expression or asymmetrical ideology here….yet. Thanks, I would have thought that the distribution would be approx normal near the expected value (central limit effect) – but I guess the chunky nature of EV possible changes tricked me. If indeed the brackets are +/- 95% I am concerned about not capturing the last-minute deciders, who will add volatility widening the uncertainty. As is, these results say the election is in the bag for Obama with less than 1/20 probability of failing! Intuition struggles with that, so to speak. 19 times out of 20, with these results, the election would be won by Obama, but that doesn’t mean this isn’t one of those 1 in 20 elections where he fails. 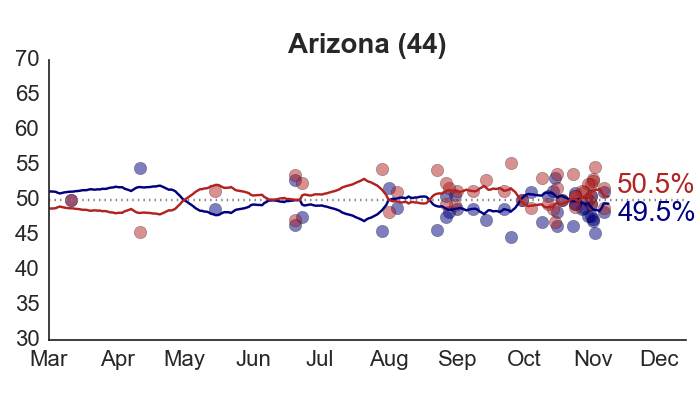 And do remember there’s quite a bit of assumptions in any model, such as approximate random sampling of eligible voters (Rasmussen’s poll seems to be skewed), self-reporting (the people saying they are eligible voters are truly eligible much less likely to vote), and other small problems. Due to the huge size of the sample, these are not likely to be critical errors. Undecided voters tend to have a higher percentage of non-voting. What I’m concerned about is that Obama supporters have a good turnout. If 1 to 2 out of 50 of his supporters don’t show, then his campaign has an issue. @Wheeler – Actually, questioning Rand or SIlver is hardly attacking them. I’ve seen plenty of attacks by poster on these sites of Rasmussen. I could say nonsense like “you just don’t understand their methodology” but I don’t, it’s possible they’re right. Saying that Silver appeared to “paper over” something amounts to a conservative attack of “poor Silver” is ridiculous. What is a “poll truther” btw. Is the new thing now to add “truther” to any attack you don’t like, sort of like adding “gate” to any political scandal? As for complaining about somebody else’s comments toward you – it’s worth noting that PEC deleted your comments toward me. What does it tell you about yourself when somebody on your own side of the argument thinks your comments are unacceptable? Meanwhile, both PEC and Votamatic have allowed my “fearsome” attacks to be posted despite their own political leanings. Maybe some liberals really are more tolerant or maybe some just recognize the difference betweeen an attack and polite disagreement. @David – I think if Romney wins, while it’s possible that the models were correct and it was just a matter of a low probability event happening, I suspect the post mortem will find issues to take with the models. 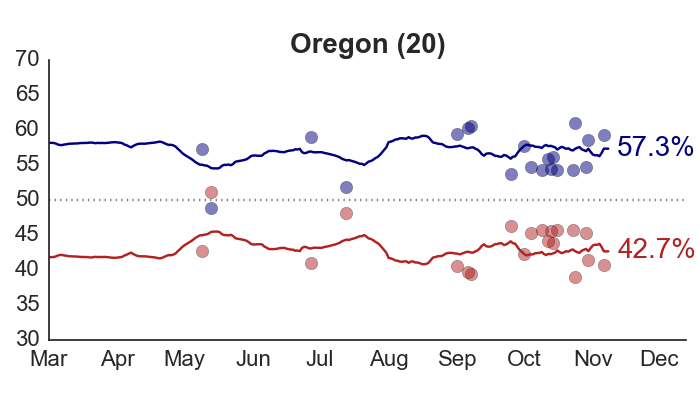 It’s not like there’ve been so many presidential elections that there aren’t plenty of factors differentiating this election from the relatively few elections these models have been run against. I will plan on coming back post election either to congratulate Votamatic or to participate in the post mortem if he’s wrong (if the latter, I will not gloat – though if the Rand poll is way off – I’ll have to point that out to a certain someone on this board). You have no idea how many of my comments Dr. Sam deletes. He thinks its mean to attack the red phenotypes in his house. “Questioning” Nate Silver is what poll-truthers do. didn’t you read my link? of course not. “Brad DeLong points me to this National Review attack on Nate Silver, which I think of as illustrating an important aspect of what’s really happening in America. 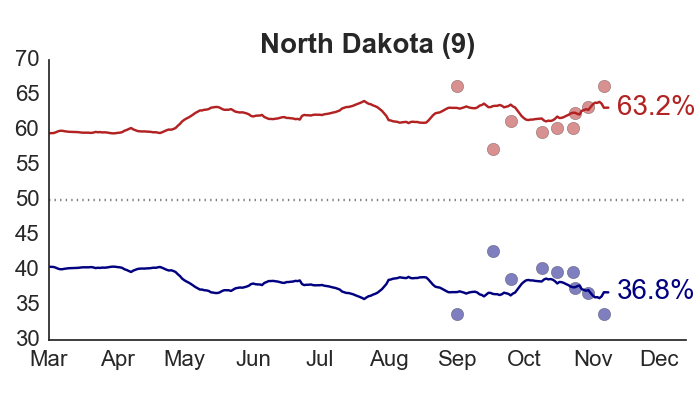 For those new to this, Nate is a sports statistician turned political statistician, who has been maintaining a model that takes lots and lots of polling data — most of it at the state level, which is where the presidency gets decided — and converts it into election odds. 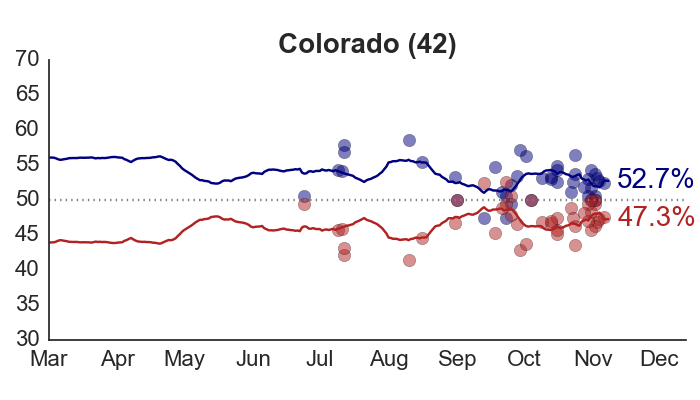 Like others doing similar exercises — Drew Linzer, Sam Wang, and Pollster — Nate’s model continued to show an Obama edge even after Denver, and has shown that edge widening over the past couple of weeks. perhaps this site is not a good place for a Talebian game theoretician loop gravity fan and evolutionary biologist to comment at. merci mille fois pour tous vos infinitifs de gentillesse, Drew Linzer. Gee, I didn’t mean to drive her off. Is that what all that French said? Not being a whatever she said she was, I lack the smartitude to comprehend her exact meaning. Anyway, I will keep my vow to come back and post congrats even if Obama wins and not gloat if he loses (frankly, I suspect Drew, Dr Wang, and Nate Silver have more to fear from Obama fans should that happen though). Especially, Dr Wang as he’s much more all in and pretty exposed out their as a Princeton prof. 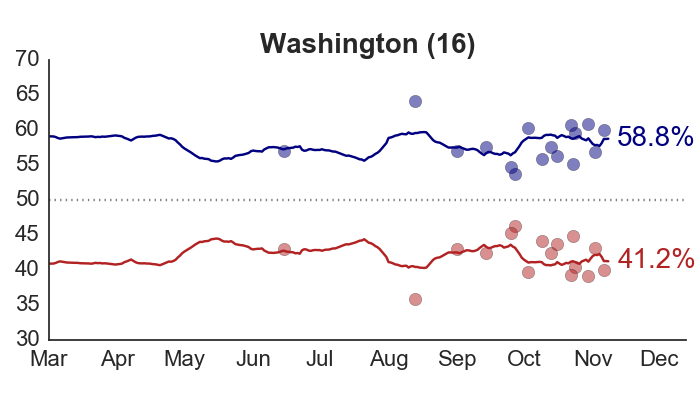 There is another aspect to the margin of uncertainty, which should worry Obama supporters. The market probability of winning is 62% for Obama and the difference for Romney (Intrade). If you have a prediction device that tells you substantially otherwise (as is the case here), then you have a type of arbitrage opportunity to make money on an expected basis. The fact that people involved with these models are not making a killing on Intrade tells me they don’t believe their models enough to profit from their results. This is a very compelling argument, since market values are the ultimate benchmark! @Allan – it is an interesting conundrum. For all we know some of them may be. I don’t blame them if they’re not as the blow to their reps will probably hurt a lot more than losing the money and maybe they don’t see themselves as gamblers. However, you would think that especially fans of PEC of which there seem to be many, would really be charging in on this since he gives the best odds at 1 in 10. I don’t have a model of my own to rely on, but I do have a deep understanding of how the American culture works, and that tells me Romney would be much more likely to win if all factors were included, not just the info revealed by polls (the delta anchoring I referred to in a previous message being the mechanism Drew’s model could use to capture that). Intrade seems to agree with this, and its Obama contracts are now steadily and consistently dropping – at this pace, Obama and Romney would reach parity by election day. I don’t like labels (conservatives versus liberals, etc), which is why it is important not to fall into the conservative mode of thinking that if a model predicts what you don’t like, the model must be wrong. In this case, I think models are not wrong, but incomplete, and with a historical sample way to short for validation, it is more than challenging to fix them! Have you seen the University of Col (Bickers and Berry) report? It is a textbook example of what happens when there isn’t enough data . I have tried to find the U of C report with no success (well just one image of a graph) . The new Rasmussen poll, for the first time, shows Romney beating Obama by two points. This is big news for those of us who believe that Rasmussen is providing the most objective take on coming presidential election. 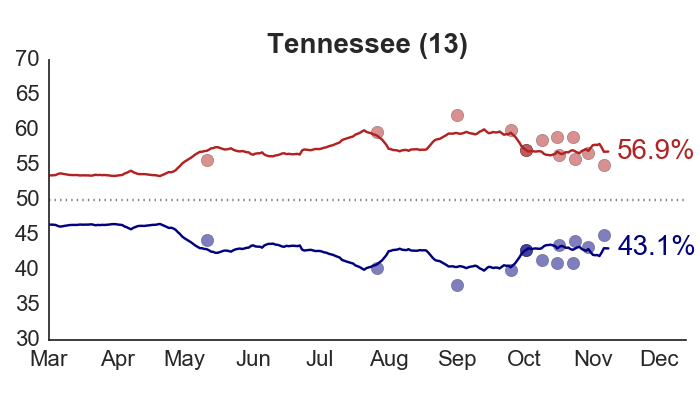 A lot of us have been predicting that the undecideds would break toward Romney. It looks like we now have evidence this is what is now taking place. 1. I’m an obama supporter. No need to call anyone who takes issue with your tone a “conservative”. a vrai dire, an Obama supporter? i just let the spell checker have it because im done here, but I have might some butthurt claquers would insist on the dernier mot. my french grandmother taught me that. merci mille fois pour tous vos infinities des gentillesse means a thousand thanks for your infinities of kindness. tant pis, because I would have very much liked to comment on the top post. As you doubtless know, besides being a neighbor of Einstein’s, and owing a cat with impeccable taste in scientists, John Wheeler was Richard Feynman’s thesis adviser and did pioneering work on the foundations of quantum mechanics and nuclear physics. 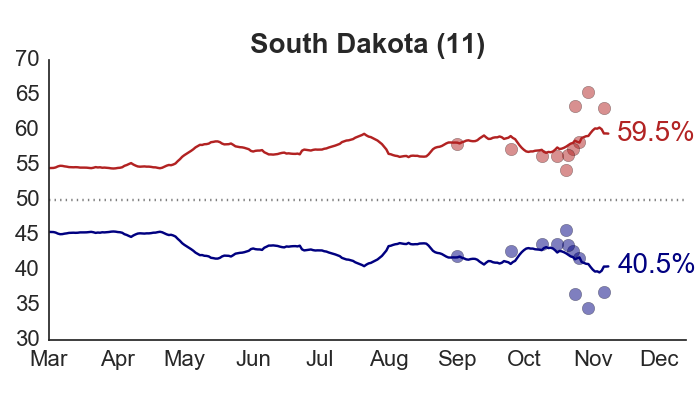 At a quick glance the U of Co model seems to be predicting a massive upset for Obama in states from Pennsylvania to Minnesota. Wonder what they will say if/when the poll aggregating sites are proved correct? shhh, Partha, this is eyes only just for you. when I came to PEC from 538 a cuple months ago, i introduced myself to Dr. Wang as Wheeler’s Cat. He replied that he is actually Feynman’s Watch. Ah, yes. We miss Wheeler/Feynman, but are stuck with ……..Romney/Ryan.